There’s already plenty of buzz surrounding Orvis and its launch of a new high-end rod line dubbed the “Helios 2.” Truth be told, I got a prototype 5-weight to play around with several weeks ago, and I noticed it had “The Second Coming” playfully inscribed just above the reel seat. So let’s call it like it is. The last five years have seen greater advances in fly rod design, among many manufacturers, than we’ve seen in the past 30 years. A lot of that has to do with space age materials, nano-silica polymers, and so forth. Rod companies are using better components to make better rods, no doubt. And it seems that every company has its own twist on creating a value pitch. I will say, for the record, that Orvis changed the paradigm with the introduction of Helios. Lighter, faster, stronger, purer… it lived up to its billing. 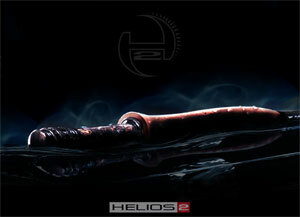 Helios changed the way we all thought about fly rods. So after a number of companies caught up (or exceeded) Helios with their own designs (a very good thing for the average consumer), I had to wonder if “H2” was a reaction or an action. I was a cynic. Then I took the prototype to the lake by my house, unfurled a full fly line, and met my backing knot for the first time in years. Does that distance translate to good fishing? Of course not. The real appeal is accuracy and control in that vital 25-45-foot range. In other words, yes, Helios 2 is all it’s cracked up to be. I’ve fished it with dries, streamers and nymph rigs, and it’s easily one of the best pure-casting (and fish fighting) all-around, do anything rods I’ve ever handled. While some of you non-Orvis dealers might think that’s bad news, I think it’s good news, because the bar just got lifted that much higher. To me, Orvis had the taper all along, at least from the original Helios. And now the company has plowed all the latest technology into enhancing that taper. Retail is $725.